Ii is such a fabulous word, isn’t it?! It fills your mouth and your mind readily conjures up images of luxury food served on fine dinner plates in exquisite surroundings most of us can’t really afford on a regular (or even irregular) basis. 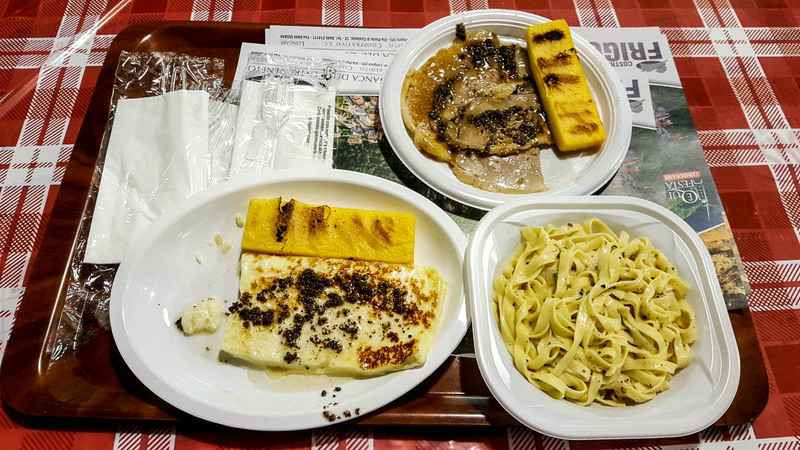 Now, the good thing about Italy is that people here know about good food, enjoy having it and have found ingenuous ways to do it without breaking the bank. One of these ways is by eating at a sagra. 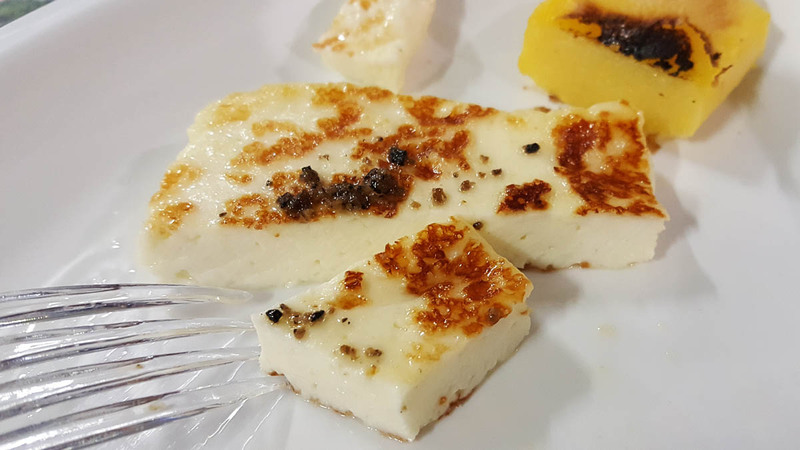 I have become a staunch fan of sagras (actually, the correct plural form in Italian is sagre) since I was first introduced to the concept about two and a half years ago. Basically, you take a product, something (usually) agricultural which is typical for a particular village or town and then you organise a whole festival around it. The focal point of this festival is the huge marquee where the food is served. The food is the star of the event and it is centred around said typical product. It could be cherries, it could be rice, it could be salami, it could be polenta, it could be peas or it could be something as esoteric and lesser-known as broccolo fiolaro which is only grown in a small area just outside of Vicenza in the Northern Italian region of the Veneto. 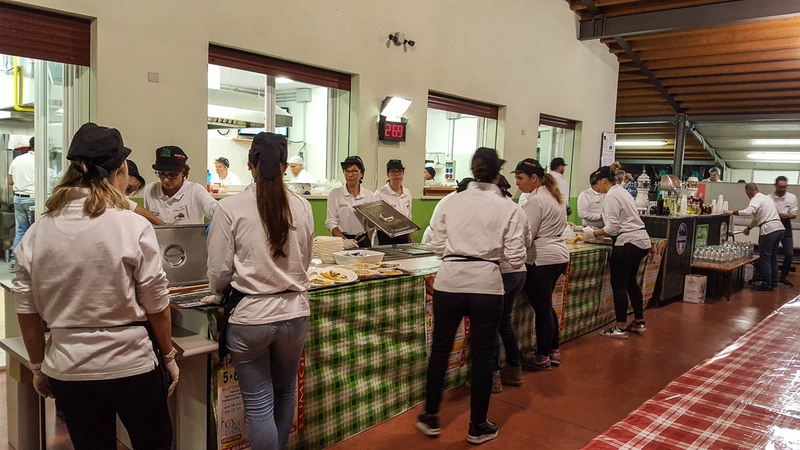 The sagra is entirely run by volunteers – from the chefs to the people clearing up. You sit on long benches flanking long wooden tables which you share with other people. The food is served on plastic plates and you eat with single use cuttlery. Yet, it always is some of the best food you have ever tried and it definitely is very, very affordable. The idea behind each sagra is to strengthen the tradition surrounding the local produce and to popularise it as much as possible. These grass-root events are very appealing to attend and they attract thousands of people over the number of days they are held – usually over a long weekend but it is not unheard of having them stretch over a whole week or even longer. 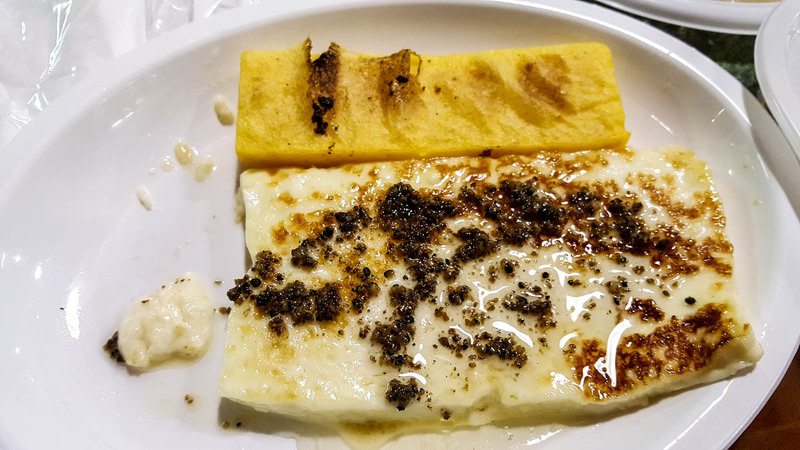 Having been to several sagre so far, they have become one of my most favourite events in Italy – a place to enjoy good food together with the locals, to learn about local traditions and, generally, to have a great night out which doesn’t cost the earth. 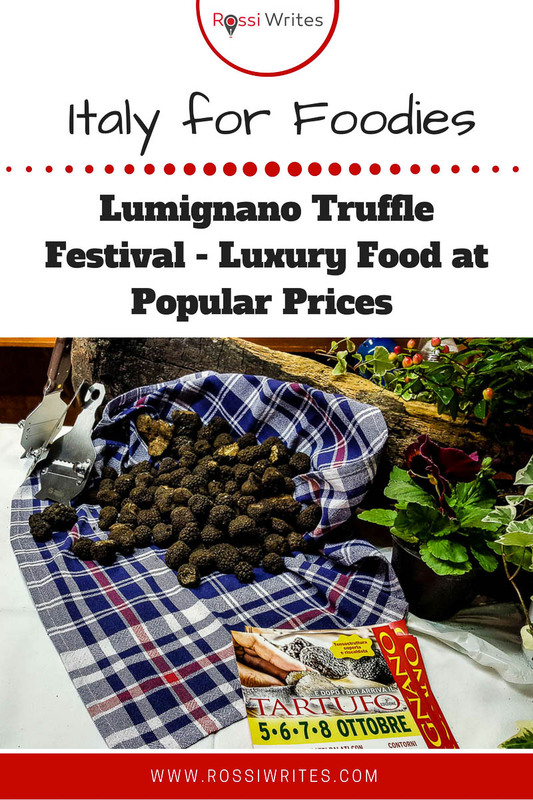 So, you can imagine my enthusiasm when I heard that the nearby village of Lumignano was getting ready for its annual Truffle Festival or, as they call it in Italian – Sagra del Tartuffo. It’s not difficult to come across truffles in Italy. When in season, they are everywhere. You can buy them individually (I still remember the truffle stalls at the Christmas markets at Lake Garda last year). You can ask for a fresh truffle to be grated over your main in a restaurant. You can join a truffle hunt (which, by the way, nowadays is done with dogs rather than sows). Or you can buy all sorts of truffle-flavoured and truffle-enriched foods like truffle oil, truffle crisps and even truffle cream cheese. Thankfully, he was just as enthusiastic as I was. I think just the notion of ‘truffles’ can be very convincing. This is how on Saturday evening (and after a very pleasant afternoon spent at the British Day event in Schio) we drove down to Lumignano. Huddled at the bottom of the Berici Hills, the village looked beautiful. We have been to Lumignano a handful of times now for its local hiking trails and for its big sagra held each spring in celebration of the locally produced peas. So, we didn’t waste any time looking around and instead headed straight for the huge white marquee to order our truffle food. Before we could get our first whiff of a truffle though, we had to queue. Yes! A huge queue curved and doubled on itself in front of the marquee. I had never seen such an incredibly long queue for a sagra. I mean, local food festivals are very popular in Italy and attract visitors in their thousands, but this was something else. It looked like half of Vicenza had made the short trek from the city to Lumignano in order to tuck in some truffles. What to do?! We weren’t about to declare defeat, so we queued for over half an hour. Having left the house earlier in the day when it was nice and sunny, I didn’t have a jacket on me and I was quite freezing by the end of it as it gradually became very cold. But we soldiered on. All in the name of the truffles! Just as we neared the pay point, we spotted a small stall set up right by the entrance of the white marquee. It sold fresh black truffles for 30 euros for 100 grams. We snapped a few pictures, but not wanting to lose our place in the queue, decided to leave buying truffles until after we had had our dinner. After all, we don’t buy truffles every day (or more like, ever) and we don’t usually spend 30 euros on 100 grams of food, so, I think, we wanted to discuss it a bit first and just get used to the idea that, yes, here we were, purchasing fresh black truffles like it was the normalest thing in the world. ‘I wonder how many truffles you get in 100 gr? !’, I said. ‘They are very light, so quite a few!’, my husband told me. Just then it was our turn to order. At sagre you place your order before you enter the food marquee. Three or four people with laptops sit within a small hut and you tell them what you want to eat. Printed menus are distributed around and people peruse them while they wait. So, once you reach the pay point you already have decided what you are going to order. Usually, there are four or five mains, chips, a couple of side dishes, two or three types of panini and drinks. Cosciotto di Maiale Arrosto al Tartufo – slices of roasted pork. 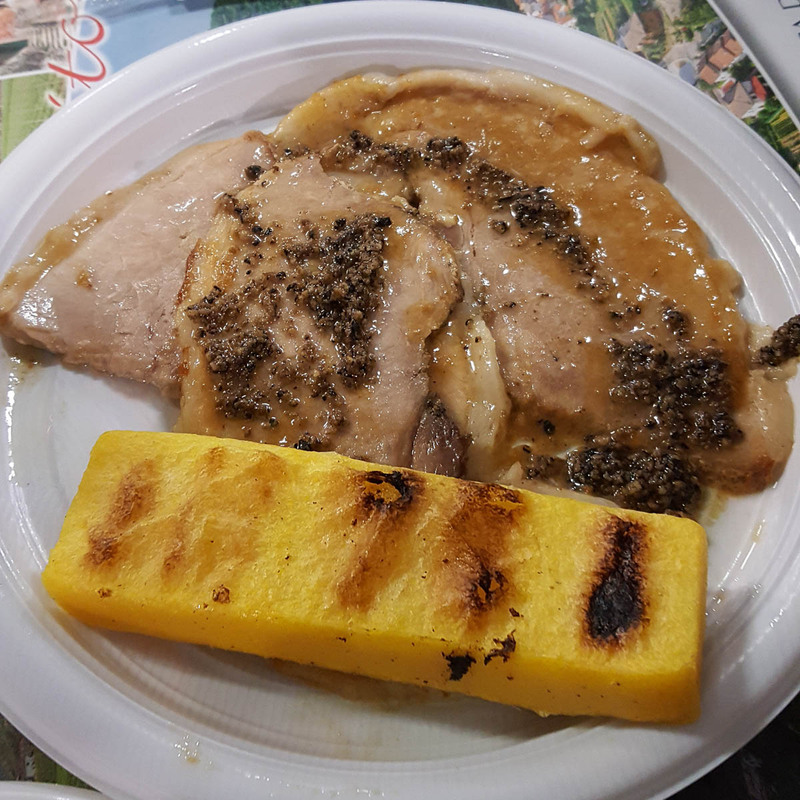 They were all generously sprinkled with slivers of black truffles and then served with slabs of thick creamy polenta. We got some more polenta to go with the mains. 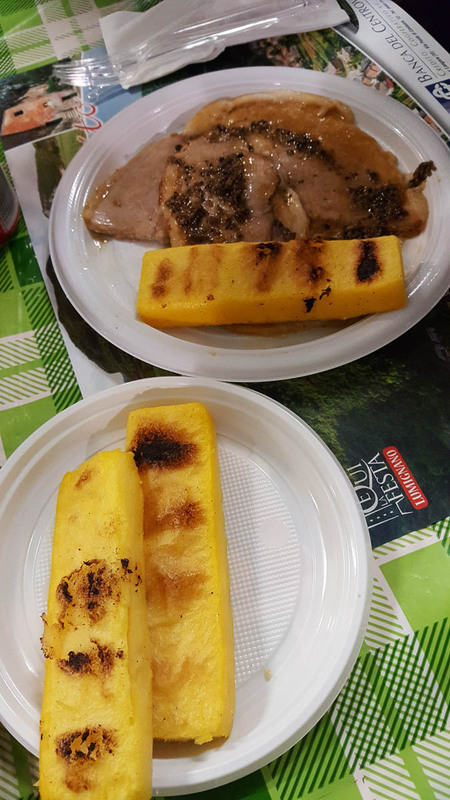 The mains cost between 6.50 and 7 euros and the extra polenta portions cost only 50 eurocents for two big slices. We paid and were given a ticket with our order number on it – 270. Once inside, we were to keep an eye on the electronic displays and go and collect our food as soon as our order number flashed on them. Inside the marque was heaving with people. The long tables were busy with whole families tucking in the lovely food. We spotted a little corner of a table getting free and by pure stroke of luck our seats happened to be right next to a group of people my husband has gotten to know through his work. We spent the time waiting for the electronic display to show our number happily chatting way. Our table corner was right at the tight spot through which people would pass with their trays laden with truffle-d food on the way back to their own tables. Every minute or so we would get a strong whiff of fragrant truffles just as we would have to duck our heads down to allow people to pass with their heavy trays. It smelled really good and I couldn’t wait to tuck in. The volunteers behind the counter worked as a very well-oiled machine. They would check the display, call out the order number it showed, collect the paper receipt from the customer waiting to get his food and then pile up plates and cutlery on trays only to repeat it all over again as soon as they had finished with the current order. The chefs were cooking in the kitchen behind the servers and the assistants were dishing out portion after portion of pungently delicious food. Finally, our number got called. It all tasted really good! 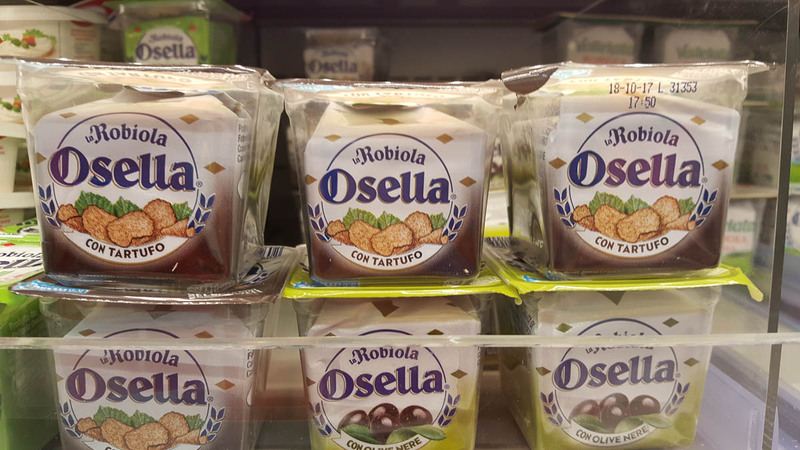 I especially loved the tosella cheese which turned out to be the perfect base for the strong truffle flavour. For the first few minutes we didn’t even speak. We were too busy just enjoying eating. Our friends had left right after our food arrived and a group of young people had taken over their places. We got chatting to the young lady sitting next to me. ‘Do you have similar food sagre in England?’, she asked. It was desserts next, but stuffed to the brim with my truffle and cheese, for the first time in my life I said a firm no to dessert, even though the selection of home-made sweets and cakes was truly nice. 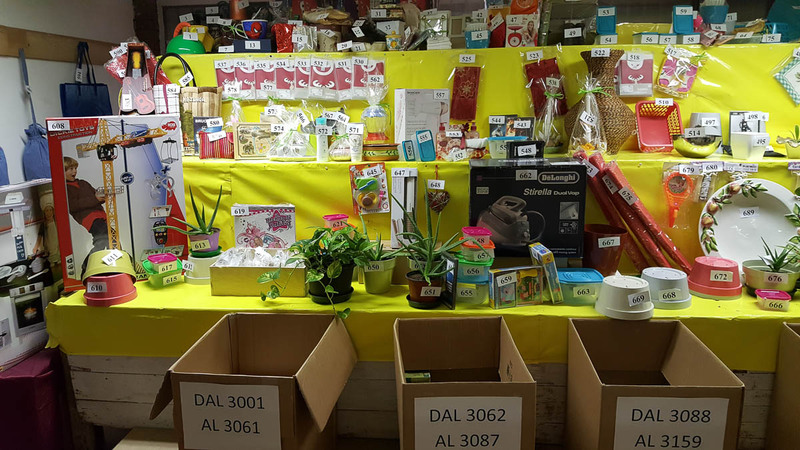 It was time for us to go, but first we popped over to check out the huge tombola taking place in a room adjacent to the food hall. For an euro per ticket there were some great prizes to be won and every ticket got a prize, no matter how big or small. We were told that tombolas such as this one aim to generate funds for a local cause, so, of course, we got some tickets, too. Once outside in the fresh night air, we stopped by the fresh truffle shack with the firm decision to treat ourselves to some. To our utter disappointment, the pile of black truffles we had seen earlier that night was completely gone. ‘I only have frozen truffles left’, the nice lady told us. After asking many questions as to how to defrost them and how to prepare them, we got a pack which was a snip at 15 euros per 100 grams. The morning after, my husband treated us all to a breakfast of eggs with shavings of black (thoroughly defrosted) truffle on top. It felt luxurious and very decadent. Truffles, I am so looking forward to my next Sunday breakfast. Do you like truffles? Or any other luxury food which is difficult to get hold of? Let me know. 1. 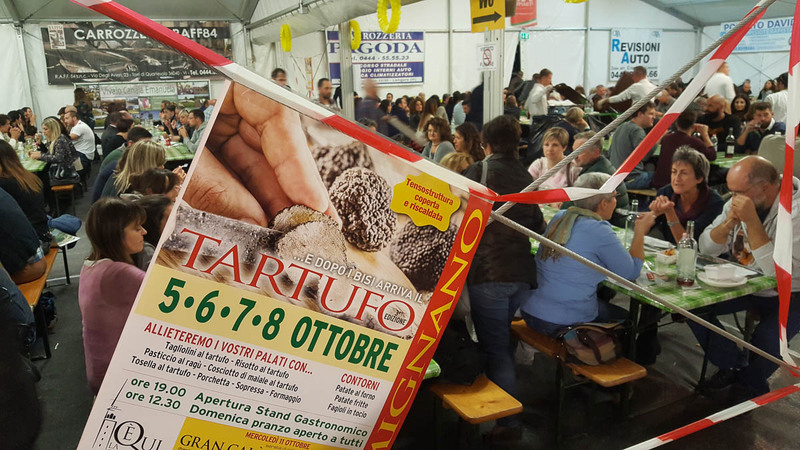 Find a list with truffle festivals and events in Italy here. 2. 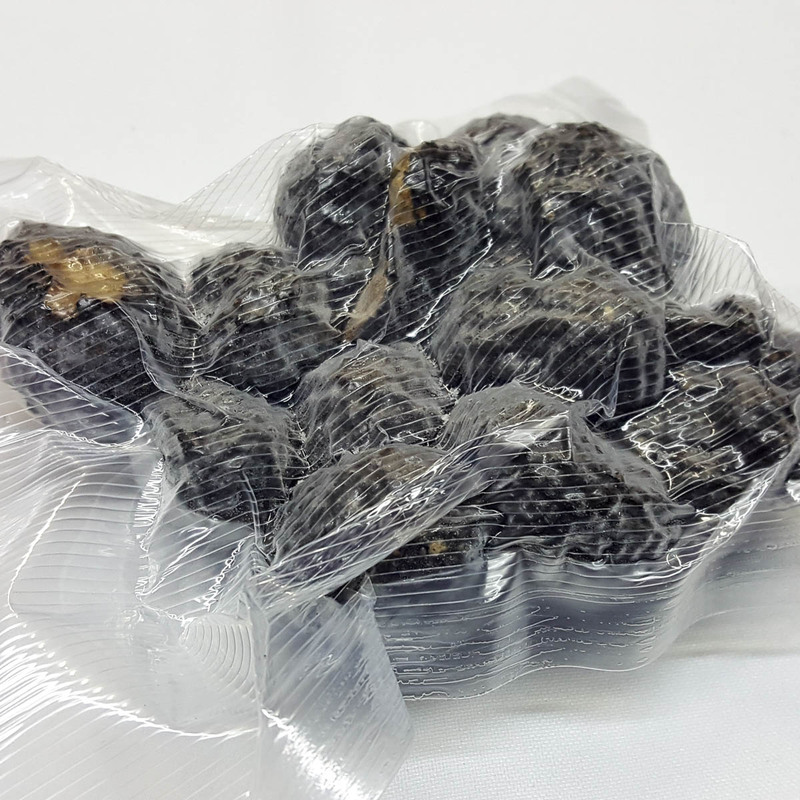 Read about the different types of truffles and how to eat them here. 3. 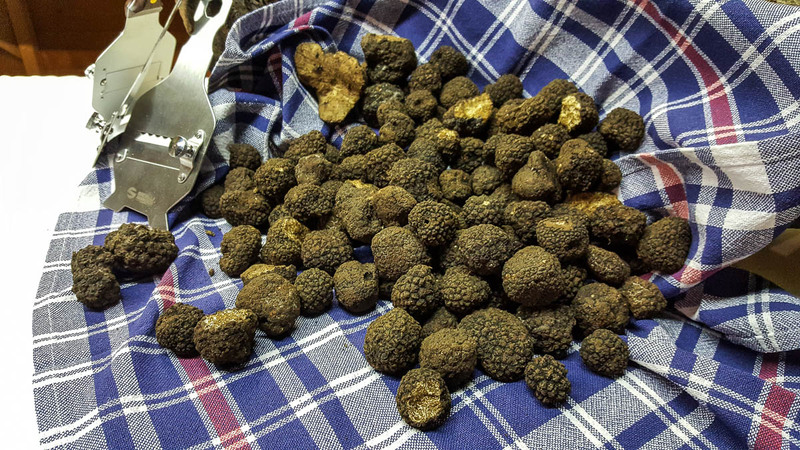 Have a look at this great description of a truffle hunt in Tuscany here.